This is not really meant to be a disclaimer as I think everyone will know that I don’t agree 100% with all of Albany’s views. I chose to post it because we need to see that anyone from any walk of life can be pro-life. I am proud of Albany for making this video. Albany Rose asked me to share her testimony about her abortion and converting to pro-life. 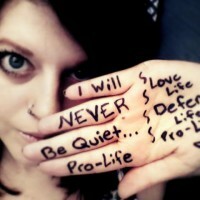 She is not religious, she is pro-gay, she is just not your typical pro-lifer. What she is, is a courageous young woman for sharing her story and for being willing to step into a heavily Christian environment and share this story.